Thomas-Morse S4C “Scouts” - the work on the Thomas Morse was lead by Tom Miller. Guys assisting were Steve Richardson, Ron Marcotte and Kevin Monahan. Steve started by finishing the painting and Kevin by finishing the varnish on TT1. Both methodically worked their way up and down and all around the TT-1 fuselage searching out nooks and crannies that had been overlooked in the refurb process. It is possible that the TT-1 fuselage structure is finally finished! In the mean time, Ron Marcotte and Tom Miller started clearing off the long workbench (and I do mean clear it off) to have a dedicated place to work on Tommy parts. The team also brought down all the parts stored in the “attic” they could find, especially the turtledecks and belly forms. Ron had previously been trying to refurb the parts alone, so he brought the team up to speed on his progress and what he felt still needed to be done. Steve and Tom Miller began laying out the parts and sizing up the task ahead. After varnishing, Kevin wheeled the TT-1 landing gear outside to begin cleaning the unit off. The landing gear was covered in caked on mounds of dirt and castor oil. Kevin worked on it for the rest of the day and made spectacular progress! It took 3 cans of Easy Off plus a can or two of foaming engine degreaser plus a lot of scrubbing and scraping but by the end of the day 95% of the gunk was gone! Parts that hadn't seen air for decades were laid bare…. To get the remaining muck the gear will need to be disassembled. Canuck - one of the day's big milestones was to fly the Canuck for 30 minutes as prep for flying the airplane to the San Marcos Biplane Fly-In scheduled for April 30th / May 1st. The airplane was pulled from the hangar and prepped - radiator topped off, oil tank filled, and av-gas put in the tank. We were successful in getting the engine to start but it seemed to idle rather raggedly, with the left bank of cylinders cutting out. Still, it seemed to run fine at large throttle openings so a flight was attempted - with the result that just after take-off the left bank quit again and the airplane immediately landed! The airplane was parked while speculation started about the cause of the left bank cylinders failing to run. We likely have a carb problem as that is the only system split into left and right cylinder bank systems. Fokker Dr.I Triplane Replica - Art Caballero has continued making progress on the re-build of the Fokker Dr.I Triplane. The airplane was ready to have the engine cowl reinstalled and the prop put back on, so a crew of guys tackled that job. Looks great all back in one piece again! In the late afternoon the Triplane was wheeled out to have the engine run, so after fueling and lubing the airplane was ready. Both Ian and Cameron Whitaker got some instruction on hand propping the airplane, but Dave Orloff took over for the actual attempt. But no joy at all, the engine refused to run. It occurred to us that while the engine was reassembled for installation it may well need a comprehensive set-up to ensure the valve lash is correctly set and the ignition is properly timed! Yeah… that *could* be the problem!! Dormoy Bathtub - David and Ian Whitaker put in some time working on the Dormoy Bathtub but I have to admit I am completely ignorant about what they worked on or the progress they made! They have been making remarkable progress on rebuilding the little bird but whatever they accomplished last Saturday was too subtle for me to catch. pick up where Ron left off on the TT-1 belly pan. There is a cross member that has to be remade. Grounds Work - Terry Bledsoe was quite busy during the workday, attending to Museum business in the HQ building and also continuing his crusade to clean up the place. Terry has been achieving remarkable results in storing things and clearing up the grounds in preparation for the upcoming Air Fair on May 7th. The ultimate authorities to detail what work went on would likely be Cameron Whitaker. Various vehicles were exercised during the day, but most of the effort seemed focused on the ambulance that recently had an engine transplant. It apparently has some issues to be resolved as the vehicle was being towed on a rope in an effort to get the engine running! Things may not be as bad as it looked to me, but…. That was it for the day. 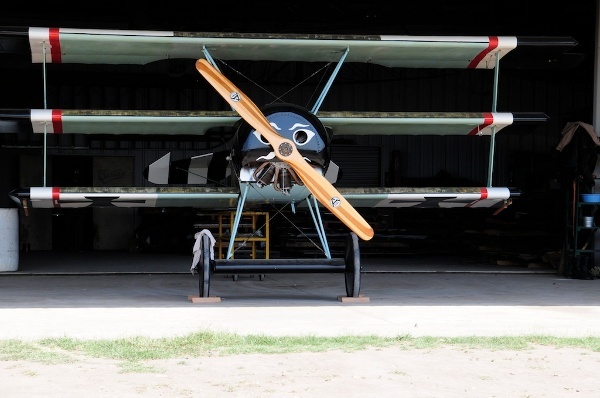 Sunday was also a workday for people who could make it out to Kingsbury, but the only person I know of who showed up was Carl Canga who resumed work on the Fokker logo adorning the right side hangar doors on the Old Hangar. Carl made some progress but then found his paint wasn't any good, so the logo will need to be finished later on.